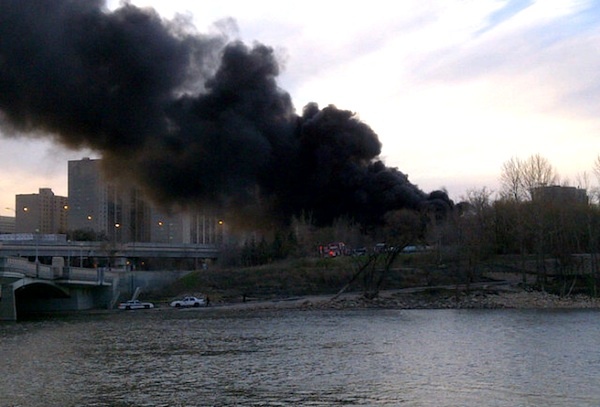 Thick black smoke filled the skies over downtown Winnipeg Tuesday evening after a fire broke out at the foot of the Norwood Bridge near The Forks. Firefighters responded shortly before 7:30 p.m. to put out what was reportedly stored boat docks that had gone up in flames. Twitter users were quick to grab their smartphones and start tweeting dozens of photos of the smoke billowing over the city. People in the vicinity of the fire reported the smell of burning rubber in the air. The fire was brought under control roughly 30 minutes later. 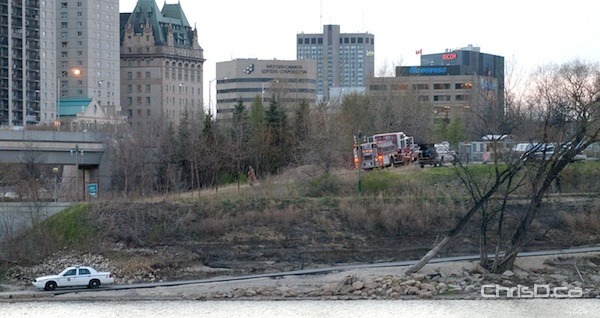 UPDATE: Wednesday, April 25 — Police confirm several portable docks caught fire, which spread to a number of trees in the surrounding area. Damage is estimated at $30,000. No injuries have been reported and the arson unit is investigating.